Despite a modest recent revival of interest in his work, Thorold Dickinson (1903-84) remains one of British cinema's most unjustly neglected directorial talents. 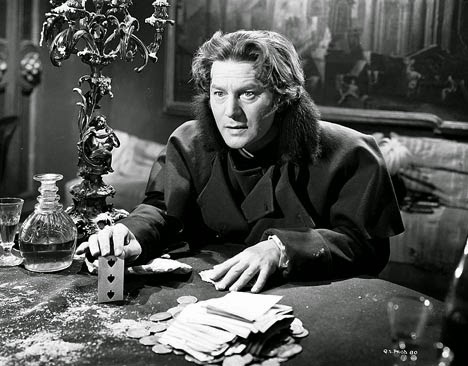 He is best known for the gloomy Victorian mystery Gaslight (1940) starring Anton Walbrook, copies of which were bought up, suppressed and destroyed by MGM when the American studio sought to promote its own version of Patrick Hamilton's play four years later. Dickinson's masterpiece only narrowly survived this ordeal and we are lucky to be able to see it today, an incident typical of the chequered and frustrating career the man endured. Perhaps the biggest mark Dickinson made was actually on academia, not the business of making movies. 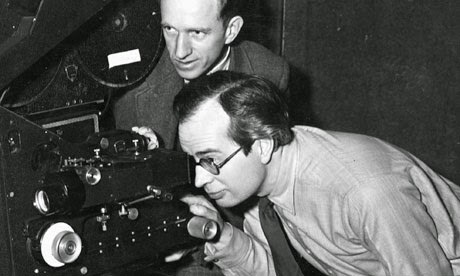 He established a pioneering film studies department at the Slade School of Fine Art, UCL, in 1960 and became Britain's first-ever Professor of Film Studies in 1967, having fought a gallant battle for cinema to be taken seriously by scholars. 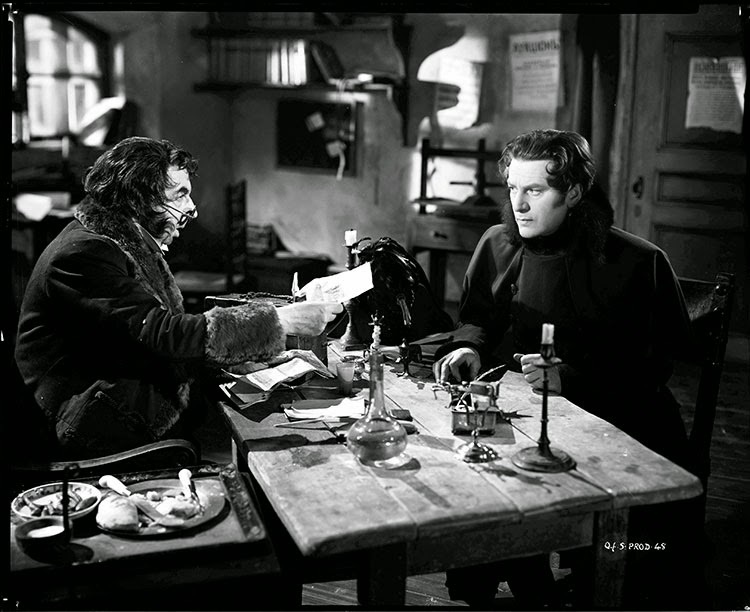 As such, I was delighted to have the opportunity to take in The Queen Of Spades at the BFI Southbank this week. Dickinson had been hired to direct this adaptation of Pushkin's famous short story at just three days' notice after Rodney Auckland dropped out, making ingenious use of a small budget to produce a truly frightening study in madness and the supernatural despite coming to the project cold, being entirely unfamiliar with the tale. Pushkin's 'Queen Of Spades' (1833), also repurposed for an opera by Tchaikovsky in 1890, tells of Suvorin, a dashing Russian army officer, and his growing obsession with learning "the secret of the cards" from a dying countess so that he may gamble his way to wealth and glory. With a cast led by Walbrook (again) and the great stage actress Edith Evans already in place, Dickinson and producer Anatole de Grunwald were forced to work frantically by night rewriting the original screenplay by Auckland and Arthur Boys to suit their purposes in time for the next day's'shooting. Their shoe-string production was hindered not only by financial constraints but also by the limited amount of space available at the studios in Welwyn Garden City, where the cast and crew found themselves on a lot too small to accommodate a horse-drawn carriage. Dickinson nevertheless managed to turn adversity to his advantage, positioning his roving camera at such angles as to mask the difficulty and using minimal lighting and candles to cast long shadows and build atmosphere in the manner of German Expressionism. Dickinson's Queen Of Spades further benefits from some fabulous costumes and sets by Oliver Messel and appropriately theatrical turns from Walbrook, Evans and Yvonne Mitchell. It also retains a pleasingly British flavour, in amongst the onion domes of St. Petersburg, thanks to its choice selection of Dickensian supporting players, with the likes of Miles Malleson and Athene Seyler cropping up as a notary and exasperated princess respectively. The result is a Gothic horror to rival Murnau's Faust (1926) or Cocteau's La Belle Et La Bête (1946). Interesting to read about this film's background. 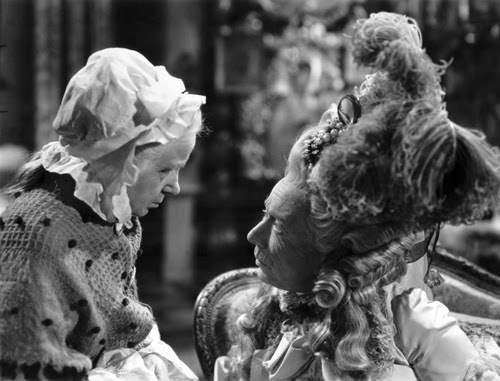 I saw it once MANY years ago, yet have never forgotten it - in part due to the performances of Walbrook and Evans, the first neurotically intense, the second odd and unsettling (you never know what the old woman is thinking, the expression in her eyes is ambiguous). Two other things made the film stand out for me - how the director used the sound of the old Countess's robes, the eerie swishing along the floors that you hear at her approach; and the genuinely terrifying funeral sequence. This film deserves to be better known as an atmospheric horror classic, along with the likes of The Innocents and the 1963 The Haunting.